- Dissolved oxygen (DO), pH, turbidity should be measured daily; alkalinity and NH3 should be measure once every 3-5 days. - PH and alkalinity are two important factors affecting the life of shrimp. When pH and alkalinity change outside the optimal range, they will greatly affect shrimp. + To control low pH, manage water color and create algae appropriately to keep the level of turbidity from 30-40 cm. During the breeding process, if pH is smaller than 7.5, use lime (CaCO3, Dolomite) at a dose of 10 - 20 kg/1000m3 of water. + To manage high pH (> 8.5), use molasses 3 kg/1000 m3 combined with the use of microbial products, or vitamin C according to the manufacturers' instructions. + To manage low alkalinity, use Dolomite lime 15-20 kg/1000 m3 at night or soda (Sodium Bicarbonate) 20ppm until the level of alkalinity is satisfied. + To manage high alkalinity, use EDTA 2-3 kg/1000 m3 at night. - Periodically use agricultural lime CaCO3 each 10 days at 20:00-21:00 PM with doses ranging from 10-20 kg/1000m3. Depending on the salinity, adjust pH appropriately (based on the actual situations of pond environment to adjust the amount of lime used accordingly). + If salinity is equal to 25 ‰, adjust pH from 7.7 to 7.8. By 11:00 AM – 12:00 PM, at noon the next day, use microbial products according to the instructions of the suppliers (use prestigious brand) to clean up the environment. - If a sudden drop in salinity due to raining, pond environment must be adjusted by sea brine (salt water) or additional salt grains. + Dissolve 2-3 kg sugar/1000 m2 and release evenly to different locations of pond at 9-10 AM. + Run paddle wheel aerators; keep aeration continuously in a few hours. + Increase the runtime of aerators, aeration. - When water temperature of the pond drops below 24 oC, and there is phenomenon of shrimp with snuggling in pond's bottom, reduce feed and increase resistance immediately. - Limit the changes of water in pond; if necessary, taking water from settling pond (through filter bags). - In the process of growing, shrimp need a lot of minerals. Alkalinity should be maintained between 120 mg CaCO3/liter or more by using CaCO3 or Dolomite lime and mineral supplements regularly (once every 3-5 days, at night) to help shrimps have hard shell quickly and molting simultaneously. - Once every 4-5 days, test the bacterial density and quality of water in bottom of the pond by using agar plates. If the density of harmful bacteria is large, use antibiotics. Only sterilize as necessary (to avoid situations such as shrimp is weakened; it is in the process of molting or has symptoms of liver disease, etc). Use antibiotics appropriately to control harmful bacteria according to the manufacturers' instructions (only use antibiotics on the list for use allowed the Ministry of Agriculture and Rural Development). Combining them with microbial products is beneficial to the management of harmful microorganisms (Super VS, CP Bio plus, enzyme HN, etc.). Note: Limit the use of probiotics in the early stage of farming, when shrimp is newly stocked to 1.5 months later. + Keep appropriate water color in pond (Chartreuse color) and stabilize environmental indicators, such as pH, alkalinity, temperature, dissolved oxygen, etc. Avoid algae in the bottom of the pond or excessive algae growth. + Keep water color appropriately (blue brown, turbid). Water depth should be about 1.4 to 1.8 m to slow down the fluctuations between day and night of temperature, dissolved oxygen, and pH to not shock shrimps. Maintaining appropriate elements, such as turbidity from 30 to 40 cm; alkalinity from 80 to 120; salinity from 10 to 15 ‰; pH from 7.5 to 8.5; dissolved oxygen > 4 mg/liter; H2S < 0.05 mg/l; NH3 < 0.3mg/l. + Once every 20-25 days, treating water and pond bottom with bioproducts in the directions that the manufacturers instruct (e.g. Eco Pro, BIO POWER, etc.). + Use paddle wheel aerators and aeration to supply oxygen from 19:00 PM to 5:00 AM the next morning. + During the farming period from 20 to 60 days old, supplements, intestinal medicines, minerals, and vitamin C can be mixed into feed under the guidance of reputable manufacturers to increase resistance for shrimp (e.g. Sanolife, calcium, magnesium, etc.). + Do not discharge domestic wastewater to farming ponds and settling ponds. 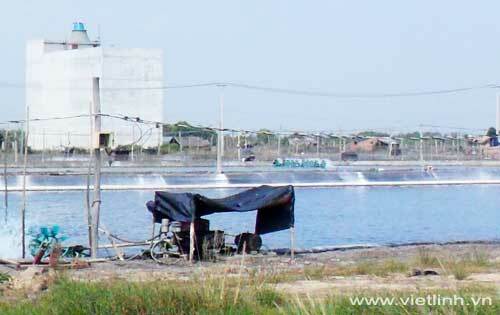 Water from sewage treatment pond should only be discharged to the surroundings if it meets the requirements. Household waste and packages of products used in farming must be in containers with lids. Those waste containers should not be located on the banks of farming ponds and seddling ponds.